On the north east corner of Henry and Second Place is a dwelling built between 1838 and 1842. The house belonged to Charles Christmas. The property included the land that currently encompasses nos. 2, 4, 6 and 8 First Place, 597, 599, and 601 Henry street and 3, 3A, 5, 7, 7A, and 9 Second place. Mr. Christmas died in 1868. In 1869 the estate was bought by John Frank Phillips. Mr. Phillips died in 1880. In 1885/86 his widow, Mary Virtue Cranford Phillips, divided the property into lots and built 13 three story brick single family dwellings which were rented until a few years before her death in 1905. By 1903 most of theses houses were sold to individual owners. In 1896 it was reported in the Brooklyn Eagle that the Charles Christmas residence on the corner of Second Place and Henry street dated from between 1838 and 1842. It was known as the "Christmas Mansion". Charles Henry born Brooklyn 1826 m. Emily Davis, lived Sourthport, Co.
1820: Immigration of Harriet Christmas and two daughters: British Brig Betsey, 17 August 1820: Mrs. Harriet Christmas 27, Harriet age 2 and Elizabeth age 1. Note: This Elizabeth died and another was born circa 1822. 1830: Charles Christmas was living on Thompson street. The census only gives heads of household. 1837: Harriet Andrews Christmas died September 4, 1837 age 45. Her name is on the Christmas Greenwood Cemetery tombstone but not listed with the rest of the Christmasses on a Greenwood Cemetery search. 1850: Brooklyn Ward 6, no address, $10,000, Christmas, Charles age 55 broker, born England, Rufus, age 22, born England, three servants (one servant a gardener). 1862: In 1862 Mr. Charles Christmas of No 1 Second Place offered a special bounty to the first forty volunteers who signed the rolls to enlist as Union soldiers between the hours of nine and ten in the morning of August 20, 1862. $5 to the first 20 men who joined Col. Conk's regiment and the same to the first 20 who joined Colonel Jourdan's regiment. 1862: In 1862 Charles Christmas's house was robbed by and skilled intruder who snuck in in the middle of the night. He stole a large sum of money which had been collected that day from rents and "strange to say"* he stole a number of family portraits. Many other properties were robbed around the same time. 1865: Charles Christmas was living at 1 Second Place in 1865 as indicated by ads in the paper. 1865 Census: (No address is listed but he was known to be living at 1 Second Place in 1865.) Brick value $22,000 Chas Christmas	70, born England, no occupation, Frederick L Christmas	30, shipping mer, born Brooklyn, Rose Ennis	21, servant, Mary Magrahan	25, servant, Margaret Harvey	30, servant, servants all born Ireland. The residence had a stable in the rear in 1865. Charles Christmas, age 77, died suddenly at his residence. He had retired form business several years previously. His house "one of the handsomest in Brooklyn" was at the corner of Second-place and Henry street. He was described as a creature of habit, which included his early morning ride. A flag was flown half mast at the stock exchange in his honor. (New York Times). 1869: The estate of Charles Christmas was being settled in 1869. In April there was an auction to dispose of the estate. For auction were an elegant residence and 12 lots on First Place, Second Place, and Henry street. "Elegant three story attic and basement, house 2[?] by 50 feet with a two story extension in the rear, and contains nineteen rooms, ten marble mantels, four marble basins, two bath rooms, four water closets, and heated by steam. The parlors are elaborately finished in fresco and gold and the entire house is (word) and painted and is in good order. The extension is two stories and contains a billard room etc. it is painted and frescoed. The front of the house is elegantly finished with brown stone trimmings, stone stoop, and railings also a stable in rear, two story brick, has four stalls and room for carriages, hay etc. On the east side of the house is a large Greenhouse [??] feet long fitted with iron steam-heating pipes and in the best manner. The entire grounds are surrounded by a costly wrought iron fence and in fount on Second Place is a double fence. The whole is stocked with the most choice kinds of dwarf fruits and berried, large vines [word] extensive arbors and the whole in a perfect state of cultivation. This property forms one of the most desirable residences in Brooklyn"
Also for sale from the estate of the late Mr. Christmas a "fine" collection of 200 Camellias No 1 Second Place corner of Henry. After the death of Charles Christmas the house at 1 Second Place, and the property associated with it, passed into the hands of John Frank Phillips and his wife, Mary Virtue Cranford Phillips. John Frank Phillips died in 1880 and several years later in 1885/86 Mary Virtue Cranford Phillips divided the property and built 13 houses. John Frank Phillips was born in Newark, New Jersey in according to a passport application of his daughter Bertha in 1920. Other records indicate a birth year of 1840. Mary Virtue Cranford was born at Prince Edward's Island circa 1820. Her family was in Brooklyn by 1850 when she was listed with her father, Robert, a hardware merchant, her mother, Mary, and several siblings - no address was listed but they were in the 6th Ward. In 1858 several Cranfords were listed in the city directory at 76 Woodhull. In 1861 the Cranfords were at 76 Woodhull street, when Mrs Cranford was working for the relief of wounded soldiers. In 1868 Robert Cranford of 76 Woodhull street was advertising a 120 acre farm five miles east of Peekskill and a mile from Shrub Oak Village overlooking Lake Mohegan and the surrounding countryside - "well watered; two good apple orchards and plenty other fruit of all kinds; house and outbuildings in good order; will exchange for Brooklyn property." Children: In 1900 Mary V. C Philipps was listed as having had 12 children of which 7 were still living in 1900. Martha and Maud attended Smith College. 1865: Horatio Gates Phillips age 36 died in November 1865 - his funeral was held at the home of Robert Cranford, Esq. 76 Woodhull street. 1868: In 1868 , Phillips, John F. broker was listed in the city directory at 76 Woodhull. 1870: In March 1870 J. F Phillips was advertising FOR SALE or TO LET a three story and basement brick house at 76 Woodhull street. The house was in "through order" and contained "all modern improvements". The lot was 21.6x100 - J. F. Phillips No. 1 Second place or 29 Broad street NYC. 1870: Brooklyn Ward 6, no address - however, according to an 1870 ad J. F. Phillips was at No. 1 Second Place. "Mr. J. F. Phillips, owner and occupant of the fine house and grounds on Henry street extending from first to Second Street" fulling endorsed the paving of the street despite the occasional appearance of "tar drawn out by the sun". The pavement which had been in for about a year was deemed a sucess as the surface was "clean, firm and uniformly even" except near Court street where there were some problems with the surface having been "cut up by travel". J. F. Philipps of "No 1 Second Place, corner of Henry" endorsed the paving of Henry street in a June 1870 letter to the editor of the Brooklyn Eagle. He claimed to be the owner of over 250 feet of frontage on Henry street. He was so delighted with the improvement that he intended to keep his family in the city for the summer instead of taking them to the country. Mr. John F Phillips a Broad street broker living at no. 1 Second place was the proud owner of a century plant that was about to bloom in August 1879. "The flower spike" was 22 feet tall and was expected to reach nearly a hundred feet when it bloomed. J. Frank Phillips	40, broker, born New Jersey, pneumonia, Mary V. Phillips	40, born England, Martha C. Phillips	14, M. Emma Phillips	13, Maud Phillips	11, Mary L. Phillips	9, Ernest V. Phillips	8, Henrietta Phillips	6, Clara H. Phillips	5, Bertha Phillips	2, Grace Phillips	1, children born New York, plus three servants and a niece. Note: The census was taken June 8, 1880. <>1880: Death J. Frank Phillips, age 40, June 26, 1880 #5618 Kings. Note: He was listed on June 8 as being sick with pneumonia. FOR SALE THE HOUSE AND GROUNDS FORmerly owned by Charles Christmas* in BROOKLYN with STABLE and CONSERVATORY. The property is 62 feet 6 inches on FIRST PLACE 125 ft on SECOND PLACE and 266 ft 10 1/2 in on HENRY ST., is near ferried and several lines of street cars. The garden contains choice dwarf pear and other fruit trees, valuable plants etc., etc. and is surrounded by a substancial iron fence." *Note: This is 11 years after the death of Charles Christmas senior. The property was still associated with Charles Christmas. 1883: Mrs. Mary V Phillips was at 1 Second Place in 1883 at the death of her nephew, Paul Cranford. 1885/86: Mrs Mary V Phillips was at 58 8th ave in 1885 and 1886. Throughout 1885, 1886 and 1887 ads were placed for a flat to rent at 1 Second place: No 1 Second Place tenants wanted in a "first class neighborhood", watchman on premises. ALSO - TO LET FLAT No 1 Second Place corner Henry first class order, good tenant wanted. AND - reduced rent "all light, lage rooms good chance for dortor or dentist, watchman on premises"
1896: J. Frank Phillips April 1896 buried Greenwood. Was his body moved from another cemetery? No NYC death record index for J. Frank Phillips in 1896. He died in 1880. 1900: 70 Eight ave., Brooklyn, Mary V Phillips	61, 12 children 7 living, Martha C Phillips	34, Clara Phillips	25, Bertha Phillips	22, Grace Phillips	21, J Frank Phillips	19, servant, Mary Morrisey	28, servant, Nora Egan	20, servant, Mary Glenn	21, servant. 1902: John Frank Phillips 70 8th Ave Brooklyn, Amherst, member of Alpha Delta Phi. Note: This was J. Frank junior. Phillips - Mary Virtue, widow of J. Frank Phillips, died Feb. 25. 1905, at her home In Brooklyn, N. Y., the city where her whole life had been passed, and where her charm of manner and beauty of character had greatly endeared her to many friends. She combined in an unusual degree the powers of intellect and of sympathy. She attracted to herself the best and choicest spirits In the circles with which she came in contact, and she drew out from those about her the best that was in them. Since her girlhood she had been a Methodist, aud for many years she had been a member of Summerfleld. In the fellowship of the church were found some of her richest joys. She loved its ministers, its people, its services, and exemplified its aims. No gladness in her life was deeper than that which came from seeing her children follow her own example, by giving themselves in youth to the service of Christ and his Church. But her throne of power I was in the home. For more than a score of years, since the death of her husband, she had filled the double place of father and of mother, training faithfully and conscientiously the happy group of children committed to her care. She built about herself a home of refinement and of culture, where the best in literature, music, and art found ready welcome. Inspired throughout by the spirit of loyalty to Jesus Christ. One said after her death, "She was a queenly woman" and the word was true. If to conceal and forget one's own sorrows, but to insist upon sharing the sorrows of others. Is true chivalry: If to be kind to the humblest and easy with the highest is true courtesy; If to love and to serve is true royalty - then this woman was a queen. And if to possess joy and peace nnd meekness and long-suffering and the other fruits of the Spirit of God; if to yield oneself a willing captive to divine love, as it comes in the person of Jesus Christ; If to put uppermost in one's living the righteousness and mercy and reverence, which the prophet exalted. If these things are the mark of Christianity, then this woman was a Christian. Her children, proud. In the heritage of her character. Indeed rise up to call her blessed. Herbert Welch. In 1885 and throughout 1887 ads had been placed for apartments at 1 Second Place. Petersen, Clouse, head age 38 born Norway, Cecelia, wife, age 41, 7 children 4 living, born Norway, Johnston, Christiana, daughter age 18, born Norway, Petersen, Cecelia, daughter, age 8, Mairie daughter age 6 and Hagne daughter age 4 all born Norway. Bull, Andrew, head 42, Norway, captain boat, Amelia, wife 42, born Norway, Mary Bull, 18, born Norway, typewriter, Fannie daughter 17, clerk store, Henry, son age 13, Marie daughter age 11, Jennie daughter age 7, Anderson, Christian age 43, brother in law born Norway. 1910: The home of Andrew Bull, tug boat captain, at 280 President street a three story and basement brick was the location of an attempted robbery in December 1910. 1899: Immigration Servia, 1899, from Liverpool, Petersen, Claus, age 38, Cecelia 40, wife, Cecilia, child age 8, Marie child age 6, Margary child age 3 and Johanna Olson, 20 servant all born Norway. They were in Ward 10 by 1910. 1915: 14th street, Claus Petersen	52, insurance agent, Cecilie Petersen	23, writer, Marie Petersen	21, computist, Elizabeth Petersen	19, editorial asst. Nos. 2 through 8 First Place are all three story brick buildings with high basements and brownstones facings on all three stories. The details of the front stonework are very similar. Likewise, the three buildings at 597, 599 and 601 Henry are similar to one another. They are also all three story brick buildings with high basements. The first story is brownstone faced while the top two stories are brick faced. The decorative work on the front of the houses is similar to each other. The houses at 3, 3A, 5, 7, 7A & 9 Second Place are diverse from the other houses on the block and in the neighborhood in general. They are all brick fronted townhouses with slate mansard roofs and "high" basements. The window detailing and other decorative elements of these houses indicate that they were build at the same time and designed by the same architect. City-Data.com say all of these houses were build in 1899. I believe that these houses were built in late 1885 and early 1886. A 1880 map of Brooklyn shows vacant lots at these addresses. These address were NOT listed in the 1880 Census. Two 1886 maps plus ads and articles in the Brooklyn Eagle indicate that these houses were in existence by at least 1886. The "1884" map shows brick houses at 3 thru 9 Second Place. This map may be misdated as newspaper articles make it quite apparent that the houses in question were built 1885/86. "ground has been broken for the foundations of thirteen houses, which are to be built for Mrs. Philips on First Place, Second Place and Henry Place. They are to be all three story and high basement houses, with plain brown stone fronts. Four of them will be on First place, near Henry street, and their size will be 16x49. Three will be on Henry street, corner of First Place, each 14x45. The remaining six will be on Second Place, and their size is to be 15x44. All will be good comfortable, twelve room houses, and the parlor of all will be furnished in hard wood. It is understood that the contract for them has been given to Messrs. Morris & Selover, DeKalb avenue. Notes: Morris & Selover were carpenters. As described above the fronts of the houses in question varied from the originally planned brownstone. This building project clearly represents the three houses on the east side of Henry between 1st and 2nd Places (numbers 601, 599 and 597), the six houses from 3 to 9 on 2nd Place and the four houses 2 through 8 on 1st Place. An article in November 1885 states that "rapid" progress was being made on Mrs. Phillips properties on 1st Place "four each 16x49", Henry street "three each 14x45" and Second Place "six each "13"*x44". Some of the houses were to be finished in December and the rest in the spring. The cost of building was at least $120,000. "There are few districts in the city more eligible for first class residers than this part of the Sixth Ward." It can be presumed that these houses had a least one bath room because two properties under construction at the same time on Third place near Henry were two stories with high basement and had nine rooms "exclusive of baths and closets". The plans for the facades must have changed. The houses on First Place do have brownstone fronts. The houses on Henry street have brownstone bottoms and brick tops. The houses on Second Place have brick fronts and are of a distinct semi Queen Anne style. The houses on Second Place are 15 feet wide. 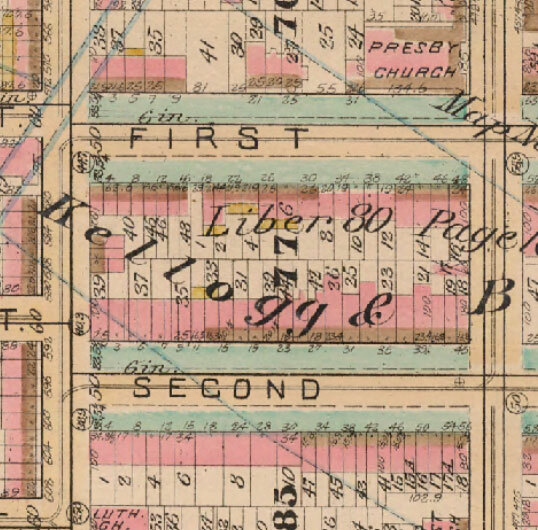 Two 1886 maps show brick buildings with brick facades at 3, 3A, 5, 7, 7A & 9 Second Place. The other buildings build by Mrs. Phillips on Henry street and First Place are shown of brick with stone facades. An ad in the Brooklyn Eagle of 1886 offers 3 Second Place as a new building. To Let - House- To Small Private Family, 3 Second Place, near Henry St., new 3 story brick, cabinet trimmings, decorate if desired; open house, John O Hoyt, Jr, 10 Court Street. Note: 3 Second is a "3 story brick house". It's facade is almost identical to the facades of 3A, 5, 7, 7A and 9 Second Place. If 3 Second Place was being offered for rent as a new 3 story brick house in 1886, it is almost certain that the other houses were built at the same time. In 1887 an ad for a girl to do "General Housework" at 601 Henry Street (between First and Second Places) was placed in the Brooklyn Eagle. In March 1888 to let or lease 597 Henry "cosy three story" between First and Second places. In September 1888 a lady's gold watch was lost by someone residing at 5 Second Place. 5 Second Place was offered "To Let" in September 1890 as "modern and very desirable" "also 601 Henry street both 3 story brick". Both houses were still being advertised in January 1891. TO LET- HOUSE -3A SECOND PLACE A three story, basement, fancy brick, 10 rooms, all improvements, $650: D. P Dahling & co, 189-191 Montague St. Note: 3A Second is a three story "fancy brick" house almost identical to 3, 5, 7, 7A and 9 Second Place. Queen Anne was a popular style in the US in the 1880 and 1890s. Queen Anne incorporated asymmetrical facades, decorative brickwork, stonework, textured wall surfaces and steeply pitched roofs. The present 3A Second Place is three stories plus a "garden level" (basement?) as described in the 1892 ad and I think it is safe to call the present 3A Second semi Queen Anne as described in the 1894 ad. A "nice large furnished room hot and cold running water, bath and furnace heat" was advertised in the Brooklyn Eagle by a "private family" at 7A Second Place in November 1897. In 1903 an agent for the Phillips estate sold eleven houses to Richard A Rendish and Rose A Miles. In less than a week Rendish and Miles disposed of six of the houses at "a handsome profit". The houses were located at 597, 599 and 601 Henry Street and 1, 3, 3A, 5, 7 and 7 1/2 Second Place and 2 and 8 First Place. "The houses on First Place are three story and basement brownstone; on Henry, three story and basement brick and brownstone and on Second Place three story brick with brownstone trimmings. Although the exterior design of the houses vary, the interior of the eleven is identical. They are all of hardwood finish containing all improvements and are a type of dwelling that is extremely popular among home seekers. All the houses were built in 1886 by Mary V. Phillips, for years a well known South Brooklyn resident. They have been well cared for and are among the most substantial private residents in the section." Mary V Phillips lived in "the old Christmas mansion" at the northeast corner of Henry and Second Place (1 Second Place) The properties were sold as a parcel. Almost immediately offers were made for the individual sales of the properties at 3, 3A, and 7 Second Place, 597 and 599 Henry street and 8 First Place. 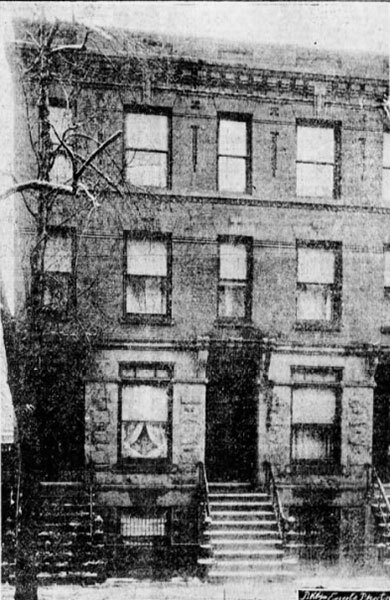 Brooklyn Life of 14 October 1903 reported the broker, A. J. Dooherr (for his clients Rendich & Miles) sold to "Dr. Lange, the three-story and basement dwelling corner of First place and Henry for $8,000." For the same owners Mr. Dooher sold a three story and basement house at 601 Henry street and a four story and basement apartment house at 1 Second* to John Maguire. Also sold were two three story and basement dwellings at 5 and 7 Second Place to "an investor". This "disposed" all eleven houses which Rendich & Miles had recently purchased from the Phillips estate. *This indicates that by at least 1903 the "Christmas mansion" had been turned into apartments. 1904, In March 1904 597-599 Henry street, "brick dwellings" were sold. In 1920 599 Henry Street, a 1 family brownstone house, was on the market to "close an Estate". The 1890 census burned so it cannot be checked. I am trying to find the 3 through 9 Second Place in the 1892 Brooklyn census, but so far I have not come up with these addresses. "bounded by the East River, Atlantic av., Court st, Forth pl. Henry st., Coles st and Hamilton av. 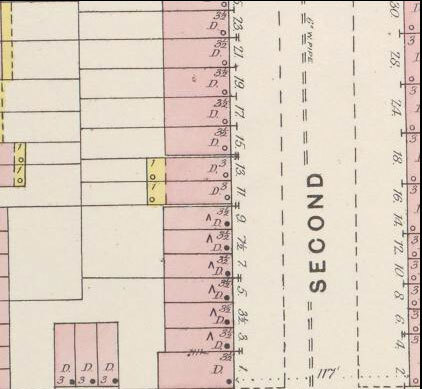 This map dated "1884" shows nos 1 through 23 Second Place and the three houses on the East Side of Henry street between 2nd and 1st Places. It also indicated the backs of the corresponding houses on 1st Place and the fronts of the corresponding houses on the south side of Second Place. Pink indicates a brick structure. Yellow indicates a wooden structure. The white spaces indicate the garden and street areas. The dashed lines indicate the actual street width. I believe this map is mislabeled as the houses from 3 to 9 Second Place were clearly not built until 1885/86. Notice that what is now 3A was then listed as 3 1/2. And 7A was listed as 7 1/2. On an 1886 map 3A and 7A were shown but not numbered. On the 1898 and 1916 maps 3A and 7A were listed as such. 1886 map showing First and Second Places with Henry street on the left and Clinton street on the right. Pink indicates brick, brown indicates stone, green indicates garden, light cream indicates yard, and darker cream indicates the street. 1904 Brooklyn Eagle ad for the sale of 597 - 599 Henry Street, "two three story and basement brick houses" sold by A. J. Dooher for Franklyn Magrath. Mr. Magrath owned several properties in the area. 1898: John Lewis Devenny, Ex-assistant United States District Attorney, died at his home at 2 Frist Place, Brooklyn of gastritis after an illness of some time. His death was not unexpected, although he was thought to be improving earlier in the month. He was born in County Mayo, Ireland in 1856 and came to American with his parents when he was four years old. He graduated from St. Francis's College in 1871 and LL.B. Columbia Law School in 1877. He joined the bar and was naturalized in Brooklyn in 1877. He opened his own law office in 1883. In 1885 he was appointed Assistant U. S. District Attorney for the Eastern District of New York and was in that position during the first administration of Grover Cleveland. After retiring as Assistant D. A. he reopened his own practice. At the time of his death he was a Judge of the Court of Special Sessions in Brooklyn for which his salary was $6,000. He was active in Ward 6 politics, a member of numerous clubs and a prominent in society. He was the junior partent in the firm of Wilbur & Devenny. He was not married. He was survived by a brother, Dr. Devenny, and three sisters. He died 22 December 1898. Funeral at St Stephen at Hicks and Summit. In January 1897 John L Devenny, council at law, was a cabin class passenger on the Teutonic from Queenstown to New York. 1880: "Devany" 32, 3rd Place, John, 48, tobacconist, Kate, 40, Lewis, 25, John, 18, Eva, 17, Josephine, 15, Emily 12, ---- 7 son, --- 5, son, and Mary age 2, plus a servant. 1892: No address John "Devanny", 58 born Ireland, tobacco broker, John L Devanny age 32, lawyer, Josephine, 21, Joseph, 17, law clerk, Mary 13. In 1897 John L Devenny was listed at 188 2nd place. So his time on First Place was limited. In 1887 he was living at 32 rd place. 1898: C. A. Lange College of Physicians and Surgeons Columbia, 2 First place Brooklyn, Intern Norwegian Hospital 1903 -1905. 1898 assistant Cornell University Dispensary Department of Dermatology. In 1904 Christian Lange was listed at 601 Henry street. See below. Henry Hague and Family at 2 First Place circa 1900 to circa 1907. Henry Hague and his family were living in Orange New Jersey in 1889. By 1897 they had moved to 2 First Place, Brooklyn as Henry Hague, 2 first Place, Brooklyn was listed in Transactions of the Entomological Society of London (1900). They lived there until at least 1907. 1895: Frank Hague was playing tennis in the race for the Orange-Hill Cup. In 1889 Henry Hague banker was listed in Orange, New Jersey in the NYC directory and in a news article. 1902: Frank B Hague clerk h 2 1st Place, Brooklyn, also Harry W manager 2 1st place, and H'y . In September 1905, Frank and H. Hague played both singles and doubles e Lawn Tennis in the Montclair Athletic Club championship. Frank Hague defeated H Hague 6-4, 6-3, 6-3 in the singles. They were defeated in the final round of doubles. 1918: Frank Hague was still playing lawn tennis. Thuston Mathison was at 2 First Place form at least 1910 to at least 1920ish. 1910 Census: 2 First Place, Mathisen, Torsten, head age 48, married 23, years, born Norway, immigrated 1895, naturalized, controller, own account house, Clara, wife, age, 40, 3 children 1 living, born Norway, and a servant age 17 born Norway. 1917 WWIDR: Henry Mathison, 2 1st Place, Brooklyn born Dec 11, 1889, salesman, single tall blue eyes, light hair. 1920: Henry Martin Mathison born November 1, 1888, address 2 First Place, Brooklyn, was listed as a first Lieutenant in the New York State Reserve Infantry. 1920: 71st street, Torstn Mathisen	55, constructor own shop, Clara Mathisen	50, Henry Mathisen	30, born New York Andrina Johnson	74, mother in law, rest born Norway. In 1923, the Caminiti family consisted of Placido, Rose, their children Frances (already married to Jack Mortillaro), Mary, Philip, Louis, August, Angela, Peter and Palma. Margaret, their last child, was born in 1924. At present, 2015, Palma Pontone, the last surviving Caminiti child, lives at 2 First Place along with her daughter Rosalind (husband Vincent) Musacchia, granddaughter Kathryn (husband Robert) Gallo and their three daughters: Kayla Rose, Ashley Grace and Gianna Marie." According to birth records listed for Marie and Philip "Canimiti" on familysearch.org Rose was born Picone. The name was given as Caminiti at the birth of Francesca in 1906. Spelling variations are quite common in the civil records. Turning an "M" into and "N" or and "R" could be a misinterpretation of handwriting. 1917: WWI Draft Registration - Placido Caminiti, 155 President street, born March 11, 1876, Italy, "Sheff" [Chef] Brist--- Restaurant wife, Rosa, tall, medium build, brown eyes black hair. 1930: 2 1st Placeowned value $14,000, Placido Caminiti	52, chef restaurant, Rose Caminiti	41 Marie Caminiti	22 Philip Caminiti	19, time keeper --- factory, Louis Caminiti	17, mail clerk, milk concern, August Caminiti	15 Angelina Caminiti	12 Peter Caminiti	10 Palma Caminiti	7 Margaret Caminiti	5 plus two tenants. Also at 2 1st Place in 1940 the family of Joseph Hunt, renting for $28, and Frank Nerna renting for $26. John Clark was married to Mary Mathews. They were at 4 first Place from at least 1900 to at least 1914. 1900 Census: Clark, Jo--- [John?] B. age 32 married 5 years, born Penn., Lawyer [? ], Ma--y [Mary?] wife age 32 2 children 1 living, born Penn, Mirianne age 6 months, born NY, Mathews Frannie, 72, mother in law, born NY, Mathews John 28, brother in law, born Penn., ---ist, and two servants. 1900: Passport application of John A Mathews, born Washington, Pennsylvania, 20 May 1872 native of the US residence 4 Second Place, Brooklyn, chemist. In 1923 John A Mathews born May 20, 1872, in Washington, Pa. was living in Scarsdale. 1903: The marriage of Mr. John Alexander Mathews of 4 first Place to Miss Florence Hosmer King of Columbus, Ohio was announced. 1906: Mrs. John B Clark of 4 First Place hosted a meeting of the Women's Club in February. 1914: The family was at 60 first place by February 1914 as indicated by an add for a "good baseball cover". 1915: As indicated by a death notice form Helen Elizabeth Pelletreau the John Biddle Clark family had moved to 60 First Place by August 1915. 1925: At 553 Third street. NOT listed in 1900 census. 1905: Thomas Shanley	28, fireman Hellen Shanley	25, wife, Hellen Byrne	47, mother-in-law, Lulu A Byrne	23, daughter, typewriter, May Byrne	21, daughter, clerk office, Kate Byrne	19, daughter, clerk office, Anna Byrne	17, daughter, clerk office. These women are obviously the daughters of Helen Byrne not Thomas Shanley. 1900 Census: O'Coner, Julia, 51, widow, born B West Indies, parents born France, 12 children 7 living, no occupation, Marie,20 born B West Indies, Saura, 18, B. West Indies, Daniel, 16, B West Indies, produce clerk, Charles, 15, b West Indies, export clerk, Eughene, 13, B West Indies, at school, Hart, Annie, servant, Ireland. The census indicates that the family immigrated to the uS in 1897 and that Mr. O'Conor was also born in the British West Indies. 1905: Dooher, Anthony J head hage 35, born Ireland, real estate agent* Mary wife, age 31 born US, Gerald, son age 10, Joseph son age 7 and a servant born Norway. *He was the agent who listed and sold the houses for the Phillips estate. 1910: Drew, Reuben, head, 32, married 7 years 2 children 2 living, born North Carolina, pilot, Alice, wife, 34, born New York, Cecil R son, 6, born New York, Everett B son, 4 born New York, 6 lodgers all born Norway, all carpenter. 1914: In November 1914 Everett Drew of 597 Henry street paid 7 dollars toward the purchase of a wolf for the Prospect Park Zoo. Cost of the wolf $40. He also contributed an undisclosed sum toward the purchase of an eagle. 1905: 599 Henry, Gause (Ganse? ), Clinton, head age 26, state bank clerk, Elizabeth wife age 26, Eliot son age 1 and a variety of boarders, 7 in number. 1909: Clinton D Ganse, stenographer, New, 599 Henry street, Brooklyn, salary increased from $1,200 to $1,499 per annum, Department of State, New York. 1910: Gause, Clinton D., stenographier bank, Head, married 7 years 1 child 1 living, Elizabeth C wife,31 Elifat F son, 6, 6 lodgers all born Norway one sailor, the rest carpenters. 1916: George Gunderson 599 Henry street was looking to book basketball games with local teams. 1905: McGlaulghlin, Isaac, age 46, born Ireland, corn, butter, etc., Marie wife, 43 England, Herbert 18 son, and three boarders. 1910: Cullen, John, age 40 married 18 years, born Ireland, imm 1888 naturalized, janitor, Agnes B, wife 39, 5 children 5 living, born Ireland imm 1884, Joseph, son 17, ---- age 15, Anna a. daughter 13, Edward, son 9, Marion daughter age 7 and a lodger born Norway, carpenter. 3 Second Place was listed as a new building in a 1886 ad in the Brooklyn Eagle. In 1900 the house was occupied by the Herzog family who were renters. By 1910 Lorenzo and Theresa Cianchetta owned the house. I did not find 3 Second Place listed in 1920. In 1930 the Lile family was at 3 Second Place. 1892: Did not find Herzog in census or directory. 1900: Census, 3 Second Place, Herzog, Elij- Aug 1856 age 43, Poland, immigrated 1868, tailor Carrie wife July 1864, age 36, New York, parent born France, Isabelle daughter, Aug 1887 age 12, New York, 1 child 1 living, Cohen, Sophia, Apr 1846 Poland, widowed, 4 children 0 living, immigrated 1870 Abraus, Annie, servant, Feb 1877, age 23, Germany, immigrated 1890. Renting. 1905: Feron, Elizabeth, head age 42, housework John son age 22 asst supt., Bessie daughter age 20 clerk office, Margaret daughter 18, tele operator, Joene, daughter age 16, at school, three roomers, two from Norway. 1910: Census - 3 Second Place, owned, Cianchetta, Theresa, head, age 31, married 13 years, 7 children 4 still living, born New York, parents born Italy, Mary daughter age 12, Margaret daughter age 11, Madaline age 9, Lawrence son 3, Manoppella, Joseph, "sister in law" age 36, Cecilia sister age 27 and Mario son age 6. 1930: Census - Lile, Lars head, rent $75, age 57, born Norway, immigrated1923 builder docks, Benoria wife age 56 married at 27 born Norway, immigrated 1928 Fredrik L son age 29 born Marquez S. Africa, immigrated 1927, insurance agent, Arthur son age 27 born Norway, immigrated 1922, carpenter house, Borglield daughter, age 26 born Norway, immigrated 1926, attendant beauty parlor Conrad D. son age 25 born Norway, immigrated 1925, builder boat, Magnhild daughter age 23 born Norway, immigrated 1928, attendant beauty parlor, Leif son age 21 born Norway, immigrated 1928, builder boats, Reidau son age 20 born Norway, immigrated 1928, builder boats, Bjorn son age 18,born Norway, immigrated 1928, clerk, cannot read, Thrend son age 16, born Norway, immigrated 1928, none, Dagmar daughter age 15 born Norway, immigrated 1928, none, Signe daughter age 10 born Norway immigrated 1928, none. Cannot find anything else under "Lile". The widow Howell and her children lived at 3A from at least 1897 to 1900. By 1910 3A was a Norwegian run boarding house. In 1920 and 1930 the widow Gundersen, a Swede, was running a boarding house at 3A. From at least 1897 to at least 1900 Mary Bensen Howell and her children lived at 3A Second Place. I did not find them in the 1880 census. 1900: Renting at 3 A Second Place in the 1900 census Mary B Howell, widow born New York May 1842. She was listed as the mother of 6 children with six still living. Listed with her was her daughter Anita Ramos, born July 1869 widowed, no children, stenographer. Also listed where the Howell children: Jeffrey (August 1870 silk salesman), Eughene B son (April 1872, confidential ????? ), Violet, (Dec 1874, school teacher, Linley daughter ( September 1881, school teacher) and Douglas (May 1884, stock clerk silk) and a servant, Ewina Hanson (September 1879, Norway). The children were all listed as born in New York. WANTED - TO DO GENERAL HOUSEWORK. A woman: references. Apply for two days at 3A Second Place. WANTED - TO DO GENERAL HOUSEWORK a girl; good bread and biscuit maker; references 3A Second Place. By 1910 Mary B Howell was living in Yonkers and several of the Howell children were living in Syracuse, New York. 1905: Gardener, Wm A. head age 54, agent R.R., Emma L wife age 53, Wm B son age 29 insurance clerk, Jennie, daughter in law age 27, W-tson, Mary aunt born Ireland, age 56. Note in 1900 they were at 9 Second Place. Things changed a lot at 3A between 1900 and 1910. Gone are the Howell family and in their place a Norwegian boarding house run Severt Kleiberg and his wife, Hansine . In addition to Severt Kleiberg and his wife, Hansine and their two children there were11 boarders in the house when the census was taken in the summer of 1910. Kleiberg,	Hausen,	Wife,	52, married 34 years, immigrated 1892, Norway,	housekeeper for roomers, no of children 2 (or maybe 12), still living cannot read. The Kleiberg family had clearly figured out how to support themselves by renting a house and taking in lodgers. All of their lodgers were Norwegian and most of them had immigrated in the early 1900s. Hansine, age 34, Anna, 22, Hans 10, and Carl 3, Kleiberg all born Norway immigrated on the Heka from Christiania to to New York on 22 October 1892. 1900: The Kleberg family, Severt, 52, machinist, Hancene, 48, Hans, 18, Charles, 13, Selma 5, and Harry age 1, were at 899 4th ave in Brooklyn in 1900. Selma and Harry were born in NY. The rest were born in Norway & immigrated in 1892. Hans Kleiberg and his wife Harriett were living in Long Branch, N J by 1920. C. M. Kleiberg was in Manhattan. Charles M. Kleiberg spent many years at sea. Albert Gunderson died at 3A Second place in February 1914. Anne Gundersen and her daughter were renting 3A Second place in 1920 and 1930. They were listed at that address in the censuses. Birth of Annie Christiansen Gundersen: Circa 1872, daughter of Peter Christiansen, Gothenburg, Sweden. Marriage: Albert Gundersen, not listed New York City Grooms index. Lillie Gundersen,	25 Mar 1900,	6005,	Births Reported in 1900. Borough of Brooklyn. Immigration of Annie Christiansen: 1894 per later arrivals in US. Service at the Lutheran Church of Our Savior; buried Greenwood. John Lamay	27, Chicago, chauffeur truck. All listed a single except where noted. All listed as lodger except the Gundersens. Carl J Christiansen, 3a Second Place, Brooklyn, N.Y., was employed on a boat as a carpenter, with no knowledge of navigation when he enrolled for the Coastwise Navigation course. Nine months later he was able to pass the examination for a position as mate, receiving an appointment as third mate on the S. S. "Mexico" Ward Line, with an increase in salary of 33⅓ per cent. He declares that this promotion is entirely due to his I.C. S course, without which he would still be a carpenter. Daniel Tharaldson lived at 3 A Second Place from at least 1918 to 1920. He lived with the Gunderson from at least 1910 to 1920, even as they changed houses from 107 Summit to 3 A 2nd Place. 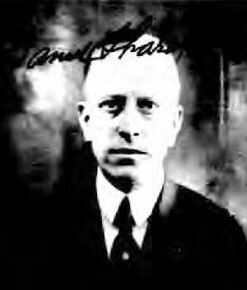 Daniel Tharaldsen immigrated to New York on the St. Paul on March 24, 1900 from South Hampton, age 16 labourer to Brooklyn, to his brother at 234 Columbia st.
Daniel Tharaldsen age 22 born Norway arrival "April 2, 1900" applied for naturalization 12 Jan 1906, address 52 Woodhull street, bartender, born Norway. He visited Norway in 1908 returning on the Oscar 11 on September 26, from Christianssand. 1918 - WWI DR: Daniel Tharaldsen 3 A Second Place, Brooklyn, age 34, born October 24, 1883, saloon keeper 300 Columbia Street Brooklyn, nearest relative, Hanna Tharaldsen c/o Mrs. Gunderson, 3 A Second place, medium height, medium build, blue eyes, light hair. In 1919 Daniel Tharaldsen was listed as a saloon keeper address 3A Second Place when he was a witness to a nationalization application. Daniel Tharaldsen born Mandal Norway, October 24, 1883 emigrated to the US from Christsand, Norway on March 17, 1900 according to his 1920 passport application. He had resided in brooklyn for 20 years. He lived at 3A Second place Brooklyn and ran a cafe. He had made a trip to Norway from May to October 1908. He planned to go to Norway to visit his mother. He was 5 feet 10 inches. Daniel Tharaldsen returned to the US on the Bergesfjord, from Kristiania Norway arriving 28 September 1920 address 3 A Second Place, Brooklyn. In October 1932 he was living at 11 3rd place upon his return from Oslo, Norway on the Stavangerfjord. Daniel Tharaldsen had a brother Theodor born circa 1873. At his naturalization in 1898 he was living at 234 Columbia street and was listed as a seaman born in "Sweden", having arrived at Philadelphia May 12, 1890. His witness was John Olsen also of 234 Columbia street. Stanley Taikeff playwright born 1940 Stanley Taikeff Biography lived at 3A Second Place. 1889/90 5 2nd Place, Charles Claghorn, principal Bryant & Stratton Business college. In 1888 a Brooklyn Eagle ad ran: "Lost between Columbia College New York and Second Place Brooklyn a lady's gold WATCH chain attached. Reward will be paid if delivered to owner 5 Second Place, Brooklyn." Kate Holloday Claghorn was born in December 12, 1863 in Aurora Illinois the daughter of Charles, a school teacher, and Martha Claghorn. C. Claghorn ran a business college in Brooklyn. They were living in Brooklyn in 1880 and 1894 (81 Columbia Heights) and in Queens in 1900. She got a PhD from Yale and was a social reformer as well as the author of several books. Charles and Martha Claghorn were listed in the first Ward of Brooklyn in 1892 - Charles age 55 teacher, Martha age 54 - no address. In 1899 the Brooklyn Eagle ran an ad for girl to do general house work at 5 Second Place. In 1901 the Brooklyn Eagle ran an ad for girl to do general housework for "a family of four" at 5 Second Place. This was most likely the Verity family which included parents, a daughter and an aunt. 1905: "Meaves" Evelyn, 27, head secty ins co, Lillian sister 23, dressmaker, Olive, sister, 21 stenographer, Marcie sister 17, stenographer, roomer, John Bornddall, age 40, pres ins co. and a servant. 1930: - Rent $75, Johnson Harold, head age 26, born Sweden, immigrated 1920 house painter, Jennie wife, age 24, born Norway, immigrated 1925, John son age 1 and a half, born New york, Nelson, Daniel, lodger, age 59, born Norway, immigrated 1890 builder dock, Moland, Sigwald, lodger, age 26, born Norway, immigrated 1924, carpenter house, A-ner, Andrew, lodger, 55 widow, born Norway, immigrated 1890 builder dock, Faircloth, Fredrick lodger, age 49, born New York, watchman building, Trigent, Thorwald lodger, born Norway, immigrated 1925, rigger shipyard, Anderson, Frederick lodger 28, born Norway, immigrated 1922, rigger shipyard, Nelson Siggurl loder age 31, born Norway, immigrated 1922 deckhand yacht. 1910 Census - 7 Second Place, rented, Louise M. Kick, age 32, born NY, parents born France, own income, Albert W. Kick, brother, age 34, born NY, parents born France, real estate, Rose Kick, sister in law age 28, born Ohio, and a lodger. 1905: October PRIVATE FAMILY HAS LARGE ROOM second floor nicely furnished; all conveniences; reference exchanged; gentlemen only 7 Second Place near Henry. In September two rooms at 7 Second place were advertised. 1920 Peterson, Nels, head age 45, immigrated 1905, naturalized 1914, Norway, labour on dock, Nellie, wife, age 38 immigrated 1905, Norway, Alfred, son age 12 born NY, Larson, Richard age 23 roomer, born Sweden immigrated 1916, fireman on shiop, Simontson R. roomer, age 57, born Norway, immigrated 1905, steward on ship. 1930 7 Second Place, Hanson, Peter, head Renting $75, age 28, carpenter house, immigrated 1921, Ellen wife, age 29, immigrated 1924, both born Norway, Thompson, Andrews lodger, age 43 married born Norway, carpenter house. 1905, Year Brook American Society of Mechanical Engineers CALDWELL, John R. (Dec 2, 1903) chief Engr. Lideerwood Mfg Co anf for mail 7a Second Place Brooklyn, N. Y. 1905: McElry, John head age 31, born Ireland, cutter clothing, Mary E wife age 30 born US, Evelyn daughter age ? months, O'Brien, Hannah mother in law, age 58 Ireland, O'Brian John son age 37, born US government clerk, Wm F son 34 clerk Am Ex. In 1920 the house was occupied by Terkel Knudson and his family. The Knudsons lived at 7 Second Place in 1920 and 1930. Terkel (AKA Thomas) Knudson immigrated to the US on April 6, 1904 on the Teutonic from Liverpool. He was listed as a sailor age 43, married, headed to a friend at 93 Carroll Street, Brooklyn. He was followed on September 9, 1904 by his daughter Gunda age 18, servant from Grimstat, to father, Terkel Knudsen 93 Carroll Street, Brooklyn on the USS United States from Christerland. Then in September 5, 1905 his wife Elizabeth age 40, Jenny age 18 and Thora age 1 and 3/4 arrived in New York going to Terkel Knudson 137 President Street, Brooklyn. Terkel (Thomas) Knudsen died in 1930. His will was probated July 8, 1930. Kings - Knudsen, Terkel (June 7) Estate more than $5,000 to Gunda Knudson Reinertsen, daughter, South Ozone Park one-third, Jenny C Giverholt, daughter, 7A Second Place, one-third, and Thora E Petterson, daughter, executrix 826 59th St. one-third. 1892: Ward 6 no address, Samuel S Marple 56, born England, merchant, Jane, "28", Agnes, 31, all born England, Edith 22 born US., Herbert 22 clerk born England and a servant. In 1892 Samuel S. Marples was listed at 42 1st Place. In 1897 he was listed a 9 Second Place. 1898 - Samuel S Marples died at 9 Second place. Born in Liverpool, Lancashire, England on 19 May 1835 to David Marple and Ann Morris. Samuel Saunders married Jane Whitworth. Jane Marples died at her residence at 323 Clinton Street, Brooklyn age 86, July 1918. 1900: Jane, Agnes and Edith on Clinton street. 1900 Census - Gardener, William A., July 1845, age 54, married 27, born New Jersey, father born Maine, mother born Ireland, R.R. cannot read, Emma wife, Jan, 1850, age 50 2 children 1 living, born New York, parents born Ireland, William B son Jan 1875 age 25, born New York, insurance clerk Watson, Mary, aunt, Feb 1840 age 59, born Ireland, immigrated 1855. Note: In 1905 they were at 3A Second Place. 1905: Moran, John age 43, coppersmith, Laura wife age 44, Laura daughter 16, high school, George son 14, John a son age 12, Lizzie, daughter age 10, Austin P. son age 3 and a servant. John A Moran was a manager of the Brooklyn Navy Yards. He built a three storied stucco "bungalow" on Shore Drive, Brooklyn. In 1885 two 16x42 two story and basement brownstones were being constructed on Third Place near Henry. "Suitable for families in moderate circumstances" they included "baths and closets", dining room with heater and buffet, kitchen with range, pantry, hot and cold water, dressers and closets. The main floor consisted of three parlors. The top floor contained four bedrooms. The bedrooms were "provided" with "ample closets, porcelain, wash basins in recesses, with hot and cold water and marble mantels". It can be assumed that the slightly fancier houses on First and Second Places, and on Henry Street had similar amenities. Tragedy in the Scandinavian Colony on Second Place. In July 1909 Mrs. Lena Knudson ran a boarding house at 8 Second Place. The house was owned by her brother-in-law, John Thompson, who kept a saloon at Columbia and Summit streets. Mrs. Knudsen lived in the basement. She and her many boarders were like "one big Happy family". "reunions of the lodgers, with singing, dancing and other diversions were frequently held." The group went on a "sailing party' on the sloop Roxanna. Eleven members of the twenty one person excursion died when the boat was hit by a squall off Norton's Point and capsized. Only one person on board could swim. The other survivors held onto roof of the cabin, "beer boxes" and bits of wood. Among those who drowned were Mrs. Knudsen's daughters, Olga Knudsen age 14 and her sister Selma age 12. Another daughter, Lizzie age 17 was not on the trip. Ole Sannes, age 30, a member of carpenters local 247 was drown. He was married with one daughter but his family had returned to Norway for a visit. Christine Samuelson, the sister-in -law of Ole, was drowned. Bergel Olsen, a charpenter and a bachelor, who had for "the past nine years" occupied a room at the boarding house of Mrs. Albert Gundersen at 107 Summit street was drowned. Bergel's roommate, Peter Berglund, another carpenter, was saved. Others who drowned were: Hattie Christiansen 8 2nd Place, Ollie England of Carroll street, Nels Eskalon 8 2nd Place, Ilda Olsen of 195 Clarkson, Ole Sandersen, 8 2nd Place and Peter Thompson a waiter. Mrs Knudsen and several other survivors were taken to the Smith Infirmary on Staten Island. Several other boats were caught in the storm and others also drowned. "Cornelius Zabriskie is a well-known financier who has lived in Brooklyn since 1882 and has been connected with some of the most important institutions in this city as a stockholder and director, among which are the Brooklyn Trust Company and the People's Trust company in both of which he holds a large amount of stock. His holdings in other enterprises also are considerable. He is a banker by native endowments and in the state of New Jersey, where his interests are extensive and commanding, he is recognized as one of the ablest and best living financiers. When Jersey City was on the verge of bankruptcy a few years ago, he took a leading part in the movement by which the crisis was averted and through his advice and earnest efforts Jersey City was placed upon the sound financial basis which it occupies at the present time. He is a director in the Hudson County National Bank of Jersey City, First National Bank of Hoboken, and the Bergen Turnpike Company of Bergen County, N. J. He had a good common school education and after leaving school studied the materia medica and qualified himself to be a druggist, which calling he followed nine years, in Jersey City. In 1863 he accepted a position with Terhune Brothers of Jersey City and soon he was placed in charge of their house furnishing department, being charged with both buying and selling. In this employment his talent for financial management became apparent and when, in 1871, his employers were burned out, he engaged in the banking business in a small way. His business grew steadily, and his transactions now amount to millions of dollars annually. He was born in that part of Bergen County, N. J. now known as Cherry Hill; his great-grandfather was a paymaster in the continental army and was conspicuous both for his bravery and for his able management of the funds intrusted to his care. He married Miss O. Addie Emerson, a daughter of the late Edward E. Emerson of Boston, and a near relative of Ralph Waldo Emerson; their home is at 15 Second place, Brooklyn . Mr. Zabriskie is a member of the Congregational Club and is well known and popular in social circles." "The lines of "First Place" "Second Place," "Third Place" and "Fourth Place," heretofore laid out bylaw, shall respectively run parallel with Laqueer street, as laid down on said commissioners' map. The northerly side or line of First Place shall begin at a point on the easterly side of Henry street, distant two hundred feet southerly from the southerly line of Carroll street as said Carroll street is laid down on said map; the northerly line of Second Place shall begin at a point on the easterly side of Henry street, distant three hundred and sixteen feet ten and one-half inches southerly from the northerly line of First Place; the northerly line of Third Place shall begin at a point on the easterly side of Henry street, distant three hundred and sixteen feet ten and one-half inches southerly from the northerly line of Second Place, and the northerly line of Fourth Place shall begin at a point on the easterly side of Henry street, distant three hundred and sixteen feet ten and one-half inches southerly from the northerly line of Third place, the southerly line of said First, Second, Third and Fourth places respectively shall be one hundred and sixteen feet ten and one-half inches from the northerly line thereof, and parallel therewith. The proceedings heretofore commenced and now pending to open said Fourth street, shall be continued and shall be deemed to apply to the said Fourth place as its lines are modified by this act." I believe the law was actually passed in 1846.